“I feel like I’m coming home.” Those were the words of former Red Sox third baseman and Hall of Fame member Wade Boggs when he learned last December that the Red Sox would retire his number “26” this May. Wade is one of only ten players that have their numbers retired and displayed on the façade in right field in Fenway Park. 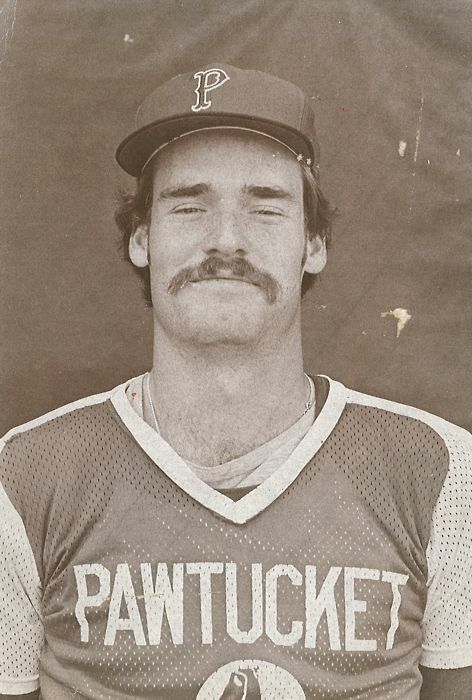 Wade Boggs signed with Red Sox at age 17, in 1976, and he began his professional career in Elmira, New York, at the lowest rung in the minors. This was his first step towards baseball’s Hall Of Fame. But during his six years in the minor it wasn’t certain that he would ever make it to the major leagues. After Wade finally made it to Boston he became an eight-time All-Star and he won five AL batting titles during his eleven years with the Red Sox. And he helped the club to three postseason appearances including the 1986 American League Champion team. Early reports from Red Sox minor league were not very encouraging. They tended to mirror the scouts judgments about speed, power, and fielding. Wade spent six full seasons in the minors before he ever got an at-bat with the Red Sox. He won the International League batting title playing at Pawtucket in 1981 and at the end of that season, the Red Sox sent him to the Puerto Rican Winter League to learn how to play first base. Wade headed to San Juan, but in his teams’ second game their regular third baseman got hurt. Wade Boggs played sparingly during the first two months of the 1982 season, but when regular third baseman Carney Lansford was injured in late-June he got his chance. Wade hit so well he played regularly for the rest of the season, ending with a .349 batting average, the highest average ever for an American League rookie playing over 100 games. The Red Sox traded former regular third baseman Carney Langford in the offseason, and Boggs’ confidence shot up. “That trade showed me that the Red Sox really believed in me.” Wade rewarded the Red Sox faith by batting .361 in 1983, to lead the American League in hitting while fielding adequately at third base. In 1985, Boggs batted a career-high .368 to win his second American League batting title and he made his first All-Star team. The Red Sox made a managerial change that season, replacing Ralph Houk with veteran manager John McNamara. “Ralph Houk was good for me as a young player but I knew McNamara was the right choice to take us to a higher level.” However, the Red Sox went 81-81 in McNamara’s first year and they finished a disappointing fifth in the American League East. The Red Sox reached first place in mid-May and Wade Boggs raised his batting average to .357. After batting .471 in May, he had increased his season average to .402. By mid-June Wade Boggs was leading the American League in hitting with a .380 average and his biggest worry was a sore rib. His sprained rib made him doubtful for the big series against the New York Yankees beginning June 16. But his world was about to be turned upside down. On June 17, 1986, Wade Boggs’ mother Susan was killed in a traffic accident in Tampa, FL. His mother was traveling with Wade’s grandmother when their car was struck by a cement truck that had run a red light. Wade learned of the tragedy when he arrived at Yankee Stadium that evening and he flew to Tampa that night. Wade was devastated by the loss of his mother. Many years later he told me, “My father was in the military so he was away a lot when I was young. It was my mother who drove me to my Little League games and my practices. She was the guiding parent for a long time. She meant the world to me and I still miss her,” he said with emotion. The Red Sox continued in first place in the American League East throughout August and at times their lead over the second place Toronto Blue Jays reached six games. But when they lost to the Cleveland Indians on August 29, their lead over the Blue Jays fell to three games. It looked like the Red Sox were going to be in a pennant race after all. The Red Sox responded with an eleven-game winning streak with strong pitching from Clemens, Hurst, and Oil Can Boyd. 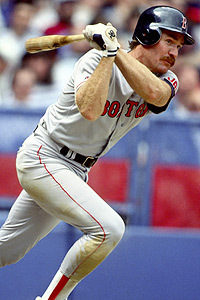 The offense was led by Jim Rice’s power hitting and Wade Boggs’ 22 hits in 11 games. With that threat behind them the Red Sox clinched the East Division championship on September 28, and they prepared to meet the California Angels in the American League Championship Series. Most observers felt the Red Sox-Angels series would go six or seven games. But in Game Five in Anaheim, CA, the Red Sox found themselves one out from elimination. Then, in one of the great postseason comebacks, the Red Sox overcame a 5-4 deficit taking a 6-5 lead on Dave Henderson’s home run. When the Angels tied the game to force extra innings, Henderson hit a sacrifice fly to give the Red Sox a 7-6 win and a trip back to Boston for Game Six and hopefully, Game Seven. Back in Boston the Red Sox still needed to win two-straight to take the ALCS Series and that’s exactly what they did. Oil Can Boyd came through in Game Six, holding the Angels to three runs in seven innings. 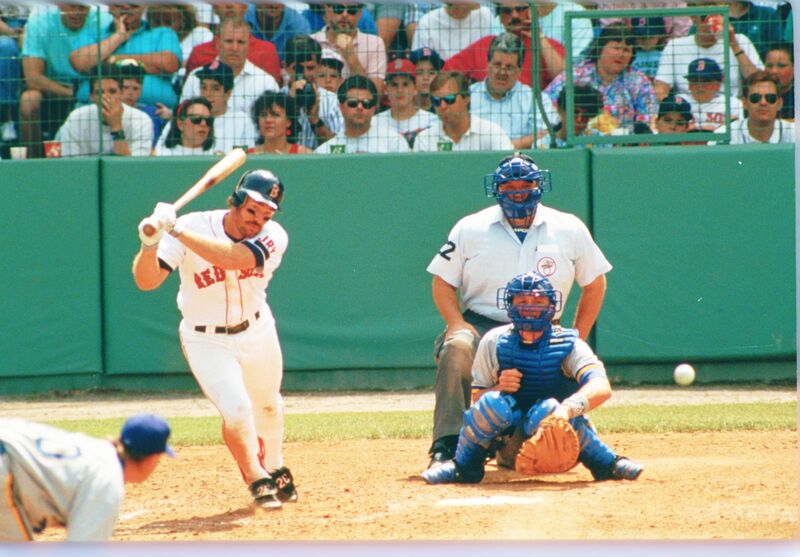 In Game Seven Wade Boggs opened the scoring with a two-run single in the second inning, sparking an 8-1 win behind a Roger Clemens gem of a complete game. The Red Sox were given almost no chance in the World Series against the powerhouse Mets, winners of 108 games in the regular season, but the Red Sox gave them a run for their money. After the Red Sox won the first two games at Shea Stadium, the Mets tied the Series with by winning Games Three and Four in Boston. In Game Five at Fenway, Dave Henderson played hero again, scoring one run and driving in another in a 4-2 Red Sox victory behind a complete game from Bruce Hurst. In a strange twist of fate, in Game Six the Red Sox found themselves in the exact situation as the Angels two weeks earlier: they were one out from winning the Series. But a combination of clutch hitting by the Mets and poor execution by the Red Sox gave the Mets a come-from-behind 6-5 win. In Game Seven the Red Sox were ahead 3-0 going into the sixth inning, but home runs by Ray Knight and Daryl Strawberry gave the Mets an 8-5 victory and a World Championship. The Red Sox storybook season had come to an end. You don’t have to ask Wade Boggs how he felt when the Red Sox lost Game Seven of the World Series to the Mets. 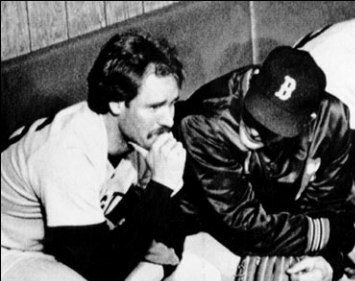 Every long-time Red Sox fan has a picture embedded in their mind of Wade Boggs, sitting all alone in the Red Sox dugout after the game, with his head in hands, letting his emotions spill out. Wade Boggs retired in 1999 season after 18 years in the major leagues. He had 3,010 career hits, and he was the 22nd MLB player to surpass the 3,000 hits level at the time. He was inducted into the Red Sox Hall of Fame in 2004, along with former teammate Bruce Hurst. Boggs was elected to the Baseball Hall of Fame in 2005, his first year on the ballot. He was only the 19th player elected to the Hall in his first year of eligibility. “I was proud to go into the Hall of Fame wearing a Red Sox cap for my plaque. The Red Sox were the team I came up with and the club that I identified with the most,” Boggs told me. 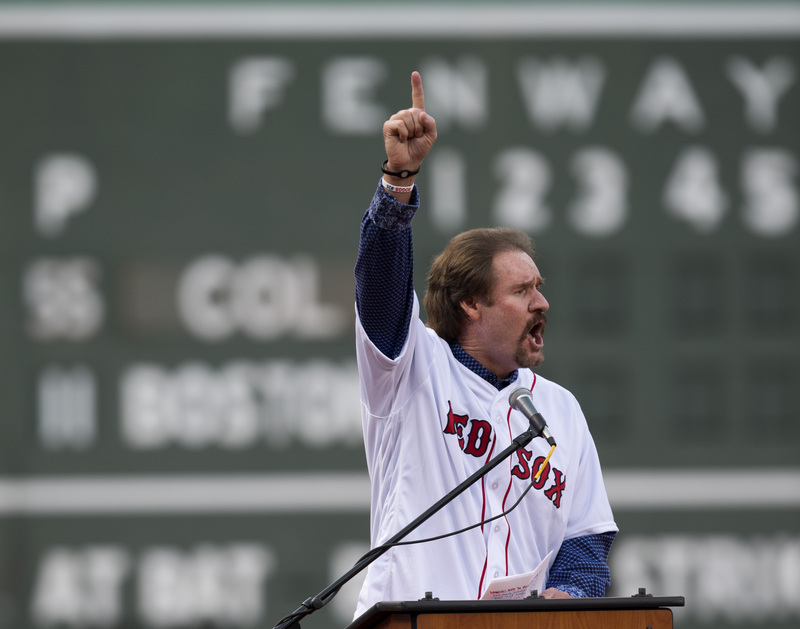 On May 26, in an on-field ceremony before the Red Sox-Rockies game, Wade Boggs took his bows before a sellout crowd at Fenway Park. Boggs was surrounded by former teammates and fellow Hall of Fame members, Carl Yastrzemski, Jim Rice, and Dennis Eckersley, and in an emotional voice he addressed the crowd. “Wow, I never thought any day could top July 31, 2005 9the day he was inducted into the Hall of Fame), but today just did,” said Boggs. “For a player to have their number retired is not a right, it’s a privilege; it’s the highest honor any players can receive from an organization. Following the game Boggs told the media that he was sure that his mother and father were watching the ceremony from above, along with his idol Ted Williams. He left the Red Sox to go to the YANKEES?? He doesn’t deserve to have his number retired in Fenway Park. As far as I’m concerned neither does Carlton Fisk. These two selections open the door for TONY CONIGLIARO’S number to be retired and it’s a gross injustice to the fans that saw Tony play. By the way, Boggs may have been a better hitter than Frank Malzone BUT, remember….Malzone won the first two Gold Glove awards ever presented AND…..BROOKS ROBINSON was among his competition. ALSO…Boggs was never known for being the ultimate TEAM player…..”nuf said.